Before Apple And Facebook, There Was Something More Revolutionary : 13.7: Cosmos And Culture More than any of today's icons — Bill Gates, Steve Jobs, Mark Zuckerberg and the rest — Guglielmo Marconi was uniquely at the center of the communication revolution of his time, says Marc Raboy. Guglielmo Giovanni Maria Marconi, Italian physicist and inventor, with one of his first wireless telegraphs. It's easy to think that the modern era in communication began in the 1990s with the birth of the Internet. But we actually have to go back further — to 1895 and the discovery that intelligible signals could travel through the "air" without a wired connection. A hundred years before Facebook and Microsoft, Google and Apple, an Irish-Italian precursor laid the foundation for today's wireless, mobile communication culture. 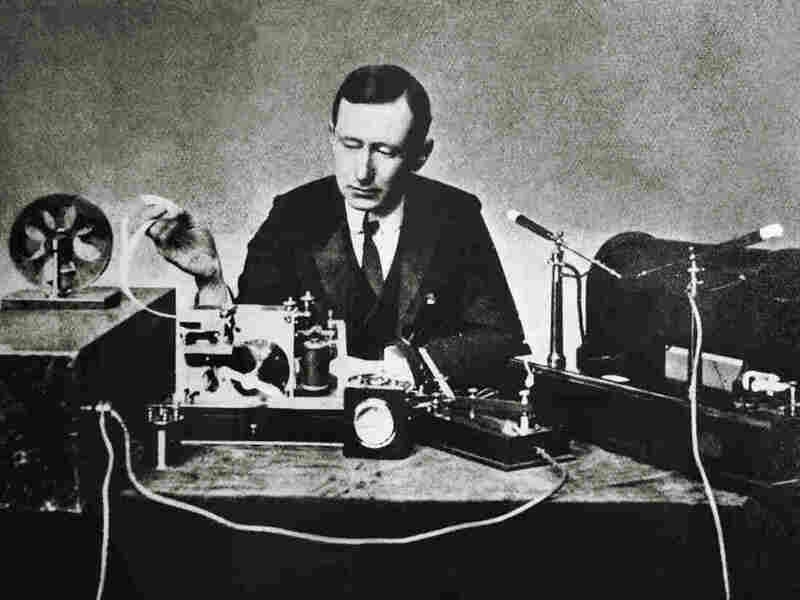 Like today's tech moguls, Guglielmo Marconi was heavily contested by some of his rivals. Like them, he rose above the fray by sheer determination, as well as talent, luck and vision. But more than any of today's icons — more than Bill Gates, Steve Jobs, Mark Zuckerberg and the rest — Marconi was uniquely at the center of the communication revolution of his time. Marconi was the first person to use radio waves to send information. In his mind, he was developing an improvement on the dominant technology of the day, the wired telegraph; using Morse code, Marconi called what he was doing "wireless telegraphy." This captured the imagination because it meant people were no longer cut off from their homes and businesses while traveling at sea — a transatlantic crossing could take a week or more in 1896, when Marconi's wireless first appeared. Voice came later, as did shortwave, radar and direction positioning. Marconi was at the centre of each of these developments. Marconi's invention meant that, for the first time, communication reached where wires could not go. He foresaw a world where one day, as he put it in 1919, "a passenger flying in an aeroplane over France or Italy might 'ring up' a friend walking about the streets of London with a receiver in his pocket..."
The first uses for wireless were military. By 1901, Marconi had a contract with the British navy, which used his system in the Anglo-Boer War in South Africa. He would do business with anyone. His system was used by the King of the Belgians in the Congo, Europe's most murderous African colony. He serviced both sides in the 1904-05 Russo-Japanese War, enabling him to write to his mother: "The War between Russia and Japan has brought a good deal of money to the Company and things are looking very well." At the same time, in public declarations, he always insisted that wireless was an instrument of peace. But Marconi's research was what drove him. His overriding ambition was to conquer distance and, in December 1901, he stunned the world when he announced, in Newfoundland, that he had received a signal from England. It was a single letter in Morse Code, three dots signifying the letter "s." There were doubters, but two months later he was in regular contact with his station in Cornwall while crossing the Atlantic, with the ship's captain as his witness. By December 1902, he was able to send complete messages between England and America. A commercial service for ordinary consumers could now be envisaged. Wireless telegrams — or "marconigrams" as they were soon known — could be sent for around one-tenth the cost of a cable. This was a boon especially for the new waves of diasporic populations who now had a cheap way of keeping in touch with home. Marconi used the courts to make sure that no one else would be able to build on his "fundamental" patent. For a while, the strategy worked. But he became too big, too powerful, too strong, and between 1903 and 1906 the German emperor, determined that wireless not be in the hands of a British company, successfully led an international move to prevent him from getting a global monopoly. Marconi continued to dominate world communication until the end of World War I, when the U.S. decided that the time had come for it to assert its own leadership in this field. Under threat of a forced takeover, Marconi sold his U.S. assets to General Electric, which promptly created the Radio Corporation of America, RCA. In the 1920s, RCA — formerly the Marconi Wireless Telegraph Company of America — became the powerhouse of U.S. broadcasting, equipment manufacturing and international telecommunication, as is well known. In England, pressure from the cable companies forced a merger with Marconi in 1928, creating the giant Cables and Wireless conglomerate, in which Marconi was the minor partner. Disillusioned with England — and disheartened by what he considered unfair treatment of Italy by the other victorious powers after WWI — Marconi returned to his native Italy. He had already joined Mussolini's National Fascist Party while still in England, in 1923. During the last 10 years of his life, he was a loyal and sometimes ardent servant of Mussolini's fascist regime, serving as head of the national research council and president of the Italian royal academy. In these roles, he, sadly, acquiesced to the putting in place of racial discriminatory policies and Italy's alliance with Hitler in the run-up to the World War II. Marconi was melancholy in the last months of his life, as he watched the brewing international conflict. "I think he felt himself a doomed man . . . he seemed to be unable to bear the thought of war between Italy and England," wrote one foreign visitor who met him in Rome. Marconi also wondered whether his gift to the world had been a good or a bad thing. Two days before his death, he asked for a private meeting with the Pope. It was granted — and no one knows what they discussed. Marconi died — conveniently, perhaps — on July 20, 1937, before he had to make the choice he was dreading. The day of his funeral, radio stations around the world — not only in Italy, but in England, the United States, Canada and as far afield as China and Japan held a minute of silence. For a brief moment the world was as it had been before Marconi changed it, irreversibly, forever. He was the first to imagine, and realize, a world of global, instantaneous, mobile communication — in short, the world we are living in today. That is how he should be remembered. Marc Raboy is a professor at McGill University and author of Marconi: The Man Who Networked the World (New York: Oxford University Press).